Apparently this is the LAST Morganville Vampires book! I'm way behind - I've only read 4 or 5 of them. But they're incredibly addictive. I want to read them all. Pretty cover! I'm hooked on this series! And you're right, they're so addictive. They are never relaxing reads because I always have to hurry to the end and out of all the trouble Caine creates. This is one of my most favorite series and the ending will probably kill me. I don't want this series to end, ever. Excuse me while I go wallow in my pain and feels...Fantastic pick! I'v never heard of this series before *hangs head in shame*. Maybe I should check it out, just worried as I like to do series marathons and this appears to be lonnnngg! I didn't realize there were so many books in this series! 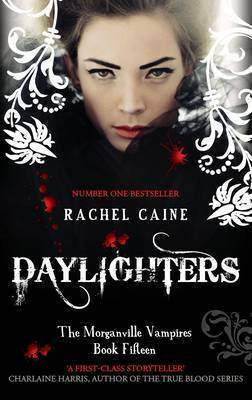 I've read the first two and I liked the different take on vampire fiction. I've heard so many good (and bad) things about this series but book fifteen! I don't think I can stick with a series with this so many books! Thanks for sharing this, Alison. I followed the entire series till this one. I just read it last week. I'm sad to see this series go. Pretty cover - it's very different than the others. I still haven't read the first book of the series, but it sounds good. thanks for sharing. Wow! 15 books already? I've never read this series. I tried reading an excerpt of the first book but I didn't really get into it. I do love Rachel's adult series though! Sounds like a great series! I'm a sucker for the paranormal!! IT'S ENDING!!! Can you even believe it? I'm behind on this series too! Book #3 is where I stopped. Whelp. Oh wow, the last. Why? I'm not ready for the story to end. I'm at book 11 right now and I love them. Great pick!